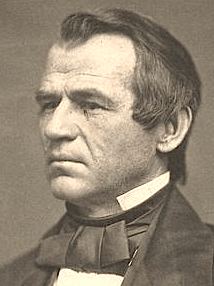 Andrew Johnson, the 17th president of the United States, took the post after an assassination — President Abraham Lincoln’s assassination, to be exact. Johnson is known as the first president to be impeached and for leading the country at the close of the Civil War. Long before his presidency, Johnson was a tailor, later becoming involved in politics and serving in the Tennessee State Senate and House of Representatives, and as governor of the state. Johnson was apprenticed as a tailor at 10, a position which he was legally required to stay in until age 21. He developed a love of reading from volunteers who read to the tailors during their working hours. At 15, Johnson ran away from his apprenticeship, eventually traveling out west to find a new life. An 18-year-old Johnson eventually found his way to Tennessee, where he settled down, opened his own tailoring business, and married Eliza McCardle, who was 16. Together they had five children. Johnson began his political career in Greeneville, Tennessee, when he was elected town alderman. He campaigned for a new constitution designed to help free people of color, among other things, and in 1834 he was elected as mayor of Greeneville. Johnson first tried to align himself with the Whig Party, but he quickly switched and ran as a Democrat. As he began to have more success, including being elected to the Tennessee Senate in 1841, Johnson decided to sell his tailoring business and devote himself to politics. At this time, Johnson ran on an anti-abolitionist anti-tariff stand, and he positioned himself as an advocate for the poor. In 1853, he won the election as governor of Tennessee, a post he left shortly after being elected into the Senate. In the first days of his presidency, Johnson focused largely on national reconstruction of the South. However, many Southern states refused to cooperate, and instead of electing new leaders, many states chose to re-elect the same leaders and drastically limit the freedoms now granted to black people in the South. In turn, Congress refused to allow the old leaders back into the legislature. Johnson vetoed the congressional bills aimed at overruling the new Southern codes, which Congress then overrode. With the conflicts between Johnson and other Congress officials rising, Congress took pre-emptive action by passing the Tenure of Office Act, which took away Johnson’s right to fire Cabinet officials. The president vetoed the measure, but then Congress overturned his veto — so it became a law. However, Johnson took no heed of the new law, saying it was unconstitutional. On February 24, 1868, the House of Representatives voted to impeach Johnson for his failure to comply. Luckily for the president, a separate vote in the Senate failed to pass — barely — and Johnson served out the remaining few months of his term. Johnson’s political career did not end there, and in 1875 he was re-elected to the Senate. However, a few short months later, he died. During Johnson’s swearing-in as vice president, he acted highly intoxicated, and afterward he went into hiding because of embarrassment over his behavior. Lincoln was said to be ashamed of his vice president’s conduct, but he also noted that one mistake should not overshadow a person’s lifetime performance. Johnson opposed the 14th Amendment, which gave African-American males citizenry. In fact, he owned slaves. Although Johnson was impeached, he was not removed from office. During the trial to remove him, Johnson narrowly escaped being kicked out by just one vote in the Senate.